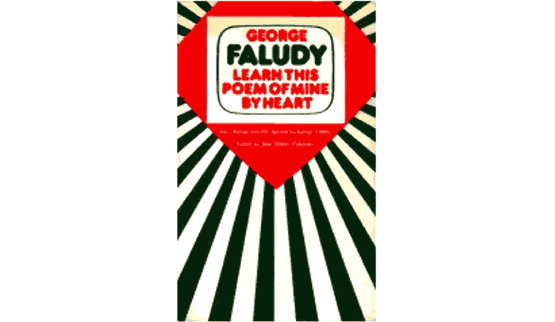 "Learn by Heart This Poem of Mine: Sixty Poems and One Speech"
About the author: Gyorgy (George) Faludy was a Hungarian poet, novelist and activist. Born on on 22 September, 1910 in Budapest, he became popular in the 1930s with his translations of Francois Villon's ballads. In 1938 he moved to Paris, but left after the Nazi occupation and ended up in the US. He returned to Hungary in 1946 and joined the editorial board of Népszava (Voice of the People), the daily newspaper of the Social Democrats. In 1950 he was arrested for "dissident activities" and spent three years in the notorious Recsk labour camp . Following the abortive Hungarian revolution in 1956, he escaped to London, where he wrote his best-known work My Happy Days In Hell. He moved to Toronto in 1967, where he worked as a university professor, and continued writing novels and poetry. After twenty years he moved back to Hungary, where his works were now permitted by the new regime. In 1994 he received the most prestigious award in Hungary, the Kossuth Prize. He died on 1 September, 2006.